We are a religious community of friars inspired by St Francis of Assisi. As Franciscans, we live and work with those who are in need of help … the poor, the disenfranchised, the needy. We serve God through the work we do...in the communities we serve. Francis of Assisi created a community of equality whose mission was to proclaim that the Good News is available to all people, especially those shunned by society. Nearly 800 years later, the Capuchins continue to build on this Franciscan tradition through prayer, contemplation, preaching, and caring for the needy. Today we preach, teach, cook, and counsel. We minister in hospitals, schools, soup kitchens, parishes, and in the mission fields. We are pastors, artists, missionaries, farmers, mechanics, and writers. All people are meant to enjoy the gifts of God's creation. This is the foundation of Capuchin-Franciscan life. The friars of the Capuchin Province of St. Joseph serve in a variety of ministries including social service, schools, chaplaincy, retreat houses and parishes in Michigan, Wisconsin, Illinois, Indiana, Montana, Arizona, California, Nicaragua, and Panama. We have served in Detroit for over 125 years. The Capuchin Province of St. Joseph began its Detroit ministry on Mt. Elliott Street in 1883 and developed a religious mission to live and work among the poor. The friars were offshoots of the Capuchin Order in Switzerland, spiritual advisers and confessors who found a home in the area of Detroit once known as Russell's Grove. It was common to see the friars traveling via horse and buggy. They would reach out to parishioners as far away as Roseville - a trip that was then a whole day's journey. Within a few years, the Capuchins built the stately St. Bonaventure Monastery on Mt. Elliott - purposely locating in a neighborhood where street people were known to congregate. Soon word spread that the Capuchins would help those in need, providing spiritual counseling as well as a sandwich. In 1924, Solanus Casey, a simple man - a simple priest - arrived at the monastery and forever expanded its focus. 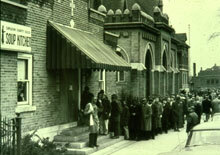 The Soup Kitchen got its official start during the Great Depression of 1929, a period of devastating national poverty that caused the poor of this Detroit community to knock on the monastery's back door asking for bread. "They are hungry; get them some soup and sandwiches," Fr. Solanus was known to say to the friars. In time the lines grew to more than 2,000 people waiting for their single meal of the day. The friars knew they had to do more. In response to the time's overwhelming social needs, the friars turned to the men and women of the Secular Franciscans and joined together with them to collect food from farms, make soup, bake bread and serve meals in the hall next to the monastery. 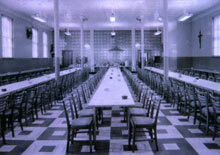 From these beginnings grew the Capuchin Soup Kitchen of today.